Lately, I have been thinking back on one of my greatest blogging victories and I can’t believe I didn’t share it with you sooner! I had been blogging for 9 months without seeing any real earnings. 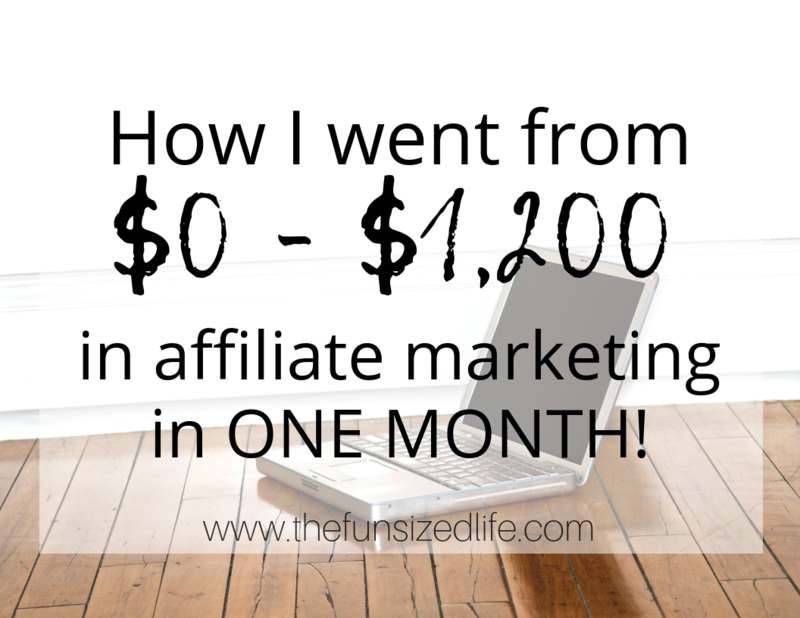 Then, by changing just a few simple affiliate marketing strategies, I went from $0 to $1,200 in affiliate marketing sales in one month! I had already read books, blog posts, and taken courses on affiliate marketing, but was still doing so many things wrong. A few tiny tweaks made all the difference. If you have been struggling to make money with affiliate marketing, you are going to want to keep reading. I will fill you in on the one simple change I made and give you the full inside scoop on how to rock at affiliate marketing. In case you haven’t heard of it, affiliate marketing is a common way that bloggers make money. Check out the other ways to make money blogging. What affiliate marketing is is recommending products or services to your readers and getting paid for it. Each brand or business that you are an affiliate for will give you a special code to use in your links. When a reader clicks on your link and makes a purchase or signs up for a program, you will earn a commission for recommending them! If you are naturally recommending things to your friends and readers anyway, affiliate marketing is something you definitely want to learn more about. I dive deeper into affiliate links in my blogging course, Fun Sized Blogging Basics. If you’re not sure how to create links in your posts, then you’re going to want to check it out. My top recommendation for getting started with affiliate marketing is to use a site that allows you to search for a variety of affiliates. The affiliate marketing site I put most of my focus into when first getting started was Share A Sale. In fact, I believe in it so much, I made my Share A Sale tutorial totally free! A good way to plan out your affiliates is to think about companies or products that you already support and are naturally already talking about. It’s super important to stay true to yourself and be honest with your audience. That is also why you need a disclosure. Because I had been running my blog for nearly 9 months, I already had a large number of affiliates that I was working with. Because the blog originally started as a health and fitness blog, I also had a wide range of affiliates. Even though I had been accepted to a lot of different affiliate programs, I still wasn’t making many sales. My traffic kept improving and I was using affiliate links all the time but couldn’t figure out why I wasn’t earning much money. I really wanted to be successful with affiliate marketing. I hadn’t started working with brands or advertising because I really wanted to focus on one thing at a time. Whenever I try to focus on too many things at once, none of them get the best results. I’m the kind of person who needs to master one thing before moving on to the next. Knowing this about myself, it seems pretty silly that I didn’t catch on to the one thing that totally changed my affiliate marketing game. I have always been a firm believer in treating my blog like a business which means I am always investing in it. Check out my free lecture to see how much it costs to start a blog. Before I even started the blog itself, I invested in a quality blogging course from a blogger that I trusted. While there are plenty of free courses in the blogging world, the paid courses always seem to offer a little bit more. In December I decided to purchase Making Sense of Affiliate Marketing by millionaire blogger Michelle from Making Sense of Cents. Because Michelle is making over $50,000 each month from affiliate marketing, it only seemed natural to learn from her! If you are struggling with affiliate marketing, there are a ton of great lessons to be learned in Michelle’s course. Some things I felt like I already knew, but the extra tips I got made the world of difference! The reason I started making money from affiliate marketing is all thanks to the information in Making Sense of Affiliate Marketing for sure. The main change I made with affiliate marketing that increased my sales like crazy was this: Focus on less than 10 affiliates when first starting out. I chose these affiliates because I had already used them and/or believed strongly that they would benefit my readers. Once I had my top 5 chosen, I made every single one of my posts contain at least three links to them. That doesn’t mean I used all 5 in every post! I would choose an affiliate to promote for each post and then make sure there were 3 different links for that affiliate. See how I plan my posts and plan my affiliate links. There were, of course, other strategies that I implemented along with this one! Making Sense of Affiliate Marketing completely lays out how to use affiliate links, how to get the most money, and how to encourage people to click on your links. If you think you need to step up your affiliate marketing game, then this course is definitely worth investing in! It sure helped me! From $0 to $1,200 with $5 commissions! I started implementing the 5 affiliate method in December and by January I was blown away by my sales. While I made a few larger sales, for the most part, I had made over $1,200 with only $5 commissions from Ibotta and Do$h! By taking the time to narrow my focus and get intentional about sharing affiliate links, I saw a huge jump in my commissions! The success didn’t stop there either! In February, I made another $1,000 in affiliate sales! When it comes to making money from your blog, you can’t just simply write a post and then instantly start making money. A lot of hard work and promoting go behind increasing page views and making sales. With my course Fun Sized Blogging Basics, I wanted to give new bloggers a chance to learn everything I have learned over the course of the last few years. When I first started investing in blogging courses, I still had so many more questions! That’s why I decided to answer those questions for you in my course. On top of jam-packed information about blogging, you also get a behind the scenes look at my actual workload. You’ll see how I pin, how to use affiliate links, and my Facebook and Instagram marketing strategies! If you really want to succeed as a blogger, make sure you invest in yourself and your business. This is the best way to see success down the road! I’m so thankful I invested in Making Sense of Affiliate Marketing and my business! Hi Renee! I’m a newbie blogger and I haven’t started the affiliate marketing yet, although been reading a lot about it. Always learning! Thanks for sharing your article! Hey Sandra!! Welcome to the blogging world! Not always an easy place, but oh, so worth it!